Background/Aims: Giant peptic ulcers (GPUs) are detrimental for all patients, especially for children. However, few reports have described GPUs in children. This study aims to evaluate the characteristics of GPUs in Chinese children and to identify risk factors. Patients and Methods: We retrospectively analyzed patients at the Children's Hospital of Fudan University from April 2014 to August 2017. Patients with GPUs (>2.0 cm) were included in the study, and the clinical data, pathological characteristics and presence of Helicobacter pylori (H. pylori) infection were analyzed to evaluate the outcomes. Results: A total of 19208 children underwent gastroscopic examinations, and 83 patients with GPUs were enrolled. The mean age of onset for GPU patients was 9.7 ± 3.2 years(range, 1-15). The main complaints were abdominal pain (92.7%), anemia (53%), retching (45.8%), hematochezia (21.7%) and hematemesis (16.9%). 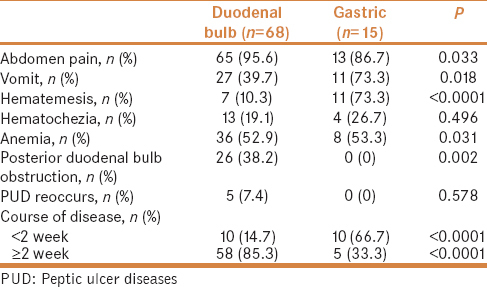 With respect to the types of GPU, 68 patients (81.9%) had duodenal ulcers, and 15 patients (18.1%) had gastric ulcers. Compared to the group <6 years of age, the group ≥6 years was more susceptible to GPU (P < 0.05). Among GPU patients, 71.1% of cases were H. pylori (*) (59/83), and 16.9% (14/83) of patients were H. pylori (-). Compared to the H. pylori (-) group, the H. pylori (*) group showed inflammatory activity, atrophy and lymphoid follicular formation in the gastric mucosa (P < 0.05). 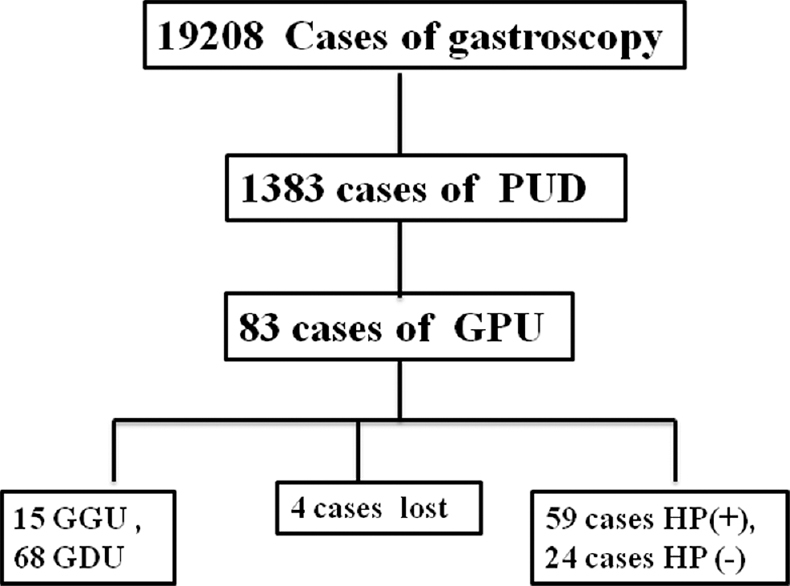 Conclusions: This study suggests that GPUs are strongly associated with H. pylori infection in Chinese children. Duodenal ulcers are the main type of GPU in patients older than 6 years. Appropriate diagnosis, treatment and follow-up are necessary for children with GPUs. Peptic ulcer diseases (PUDs), which occur mainly in the gastrointestinal mucosa due to the erosion induced by gastric acid and pepsin, are relatively common gastroenterological diseases. PUDs develop because the protective mechanism of the gastrointestinal mucosa, such as secreted mucus and bicarbonate, are overwhelmed by the damaging effects of pepsin and gastric acid., With the development of endoscopic technology, most PUDs can be detected and cured by an effective treatment., Nevertheless, giant peptic ulcers (GPUs), including giant gastric ulcers (GGUs) and giant duodenal ulcers (GDUs), are still commonly observed. GPUs are associated with high rates of morbidity, mortality, and complications compared with standard-sized ulcers. GPUs can impose a substantial socioeconomic burden and can negatively affect patients' quality of life. However, few studies have described GPUs, especially in children. The aim of this study was to analyze the clinical characteristics, presence of Helicobacter pylori (H. pylori) infection, and study the outcome of GPU in Chinese children. Children admitted with gastrointestinal symptoms were enrolled in this study, and all relevant clinical data were recorded. H. pylori infection was diagnosed based on invasive methods, that is, culture of the biopsy specimens, standard rapid urease test (RUT), histopathology test, or non-invasive test, including the urea breathe test (UBT).,, All children underwent upper gastrointestinal system endoscopy due to abdominal pain, hematemesis, anemia, hematochezia, and other findings. Among patients undergoing endoscopy, macroscopic findings were noted, and gastric biopsies (antrum and corpus) were taken for histological diagnosis. The patients were divided into an H. pylori(+) group and an H. pylori(–) group. The H. pylori (+) group received triple therapy with amoxicillin + clarithromycin + omeprazole, or metronidazole + clarithromycin + omeprazole for 14 days. PUD was defined by the presence of an active, healing, or scar-stage ulcer in the stomach or duodenum. The diagnostic criteria of mild (Hb <90 ~ 120 g/L for children ≥6 years old and <90 ~ 110 g/L for children <6 years old), moderate (Hb: 60 ~ 90 g/L), and severe anemia (Hb: 30 ~ 60 g/L) in children was adopted as per standards of the World Health Organization (WHO), with a slight modification made according to the Chinese children nutrition conditions. The data were gathered from the electronic database, endoscopy records, autopsy records, and radiography. The medical records of all patients were evaluated to determine their characteristics and outcomes. All patients were contacted by phone for long-term follow-up. Descriptive statistics for continuous variables were calculated and expressed as reported, as the means ± standard deviation (SD). Categorical variables were described using frequency distributions and were reported as numbers (%). The Chi-squared test was used to analyze the categorical variables. Data were analyzed using SPSS Statistics 16.0 (SPSS, Chicago IL) statistical software. A value of P < 0.05 was considered significant. A total of 19,208 patients underwent gastroscopy from April 2014 to August 2017 [Figure 1]. Among them, 1,383 had PUDs (7.2%). Of the 83 patients (6.0%) with GPUs, 64 were male and 19 were female. The median patient age was 9.7 ± 3.2 years. Thirteen patients (15.7%) were <6 years old, and 70 patients (84.3%) were ≥6 years old. The most common symptoms were abdominal pain (78/83, 94.0%), retching (38/83,45.8%), hematemesis (18/83,21.6%), hematochezia (17/83,20.5%). 53.0%(44/83) patients had anemia with 21.7% mild anemia, 24.1% moderate anemia and 7.2% severe anemia. Abdominal pain lasted less than 2 weeks in 7 patients (14.9%), 2 weeks to 2 months in 9 patients (19.1%), and more than 2 months in 31 patients. Fifteen GGUs and 68 GDUs were found in these patients with GPUs via endoscopy or imagological examinations [Figure 2]a,[Figure 2]b,[Figure 2]c,[Figure 2]d. Abdominal pain, anemia, and retching were the main symptoms in these patients. The symptoms and disease course of GGUs and GDUs are shown in [Table 1]. [Table 3]. Among GPU patients, 75.9% were >6 years old. Furthermore, H. pylori infection was the main cause of GDUs in children aged >6 years (53/70). Among the 83 patients, four were lost to follow-up (one had Langerhans cell histiocytosis, and the other three patients were transferred to other hospitals and could not be contacted). Seventy patients received formal treatment, including one patient who underwent hemostasis under endoscopy. The average follow-up time of the 70 patients was 23.0 ± 11.2 months. Sixty-six patients were re-examined under endoscopy, and the average time until re-examination was 4.9 ± 2.9 weeks. Fifty-seven patients exhibited remission, and 54 patients required hospitalization. Fourteen of 83 patients had recurrence of peptic ulcers (16.9%), and two patients exhibited duodenal stenosis and underwent surgery. The history of GDU dates back to 1931, when Brdiczka first described these exceptionally large ulcers. A GPU is an emergency for the gastroenterologist, especially in children, because of their higher rates of perforation, massive hemorrhage, severe anemia, and other serious complications. For adults, PUDs present with various symptoms, such as epigastric pain, dyspepsia, nausea, and anorexia. However, serious complications such as bleeding or perforation may be the first sign of a problem without any other warning symptom, and these complications occur in approximately 25% of PUD patients. Reports of GPUs in children are uncommon. Unlike the adult population, symptoms cannot be used to diagnose PUD in children. For children with GPUs, abdominal pain is the main symptom, which occurs mainly in the upper abdomen. However, other patients experience pain in the periumbilical region or other abdominal regions, and some experience involvement of the right hypochondrium, which is difficult to locate. For the pediatric gastroenterologist, a PUD should be considered when the patients have abdominal pain. Biliary and pancreatic diseases should be included in the differential diagnosis, and the appropriate examinations are needed. Furthermore, anemia is another symptom common in GPU patients; 53% of patients have anemia, and 7.2% have severe anemia. Therefore, for children with refractory or severe anemia, a GPU should be considered. Hernandez et al. reported that of 40 patients who developed PUDs, 35 (87.5%) had DUs, while 3 (7.5%) had GUs. Similar to their results, in this study, 68 GPU patients (81.9%) had DUs, and 15 patients (18.1%) had GUs. Since the introduction of endoscopy, the diagnostic accuracy has markedly improved. The other obvious benefit of endoscopy is the ability to perform a biopsy. The radiographic diagnosis rate of barium meal and CT is difficult to determine because this method is used only as a second-line method for the diagnosis of peptic ulcers. In this study, all the GPUs were diagnosed by endoscopy, and it is essential to examine the location of the GPUs and evaluate the size of the ulcer. This study revealed that GPUs occurred most often in children older than 6 years. Consistent with the findings from another group, H. pylori infection is the main etiologic factor for PUD. In this study, 66.7% of patients, 40% of GGU patients, and 71.4% of GDU patients had H. pylori infections. The development of H2 blockers and proton pump inhibitors (PPIs) and the discovery of a standard treatment for H. pylori infection have increased the trend toward increased medical and decreased surgical therapy. Compared with GGU, GDU has the following characteristics: (1) GDU has a higher H. pylori infection rate; (2) exhibits more severe pathological inflammation; (3) has a longer disease course; (4) is characterized by abdominal pain and is often accompanied by moderate anemia; and (5) occurs more often in older children and more in males than in females. In adult PUD, the course of treatment for DU lasts 4 weeks, and that for GU lasts 6 to 8 weeks; additionally, the ulcer healing rate is greater than 90% according to gastroscopy results. However, data on the treatment of GPUs in children are scarce. In this study, we found great differences between children and adults. We suggest that the treatment course for GDU should be 6 to 8 weeks and that for GGU should be 2 weeks. For H. pylori-infected patients, the treatment course for GGU should include H. pylori eradication therapy plus an additional course of an ulcer-healing drug to reduce the recurrence of GPU. After H. pylori eradication therapy or omeprazole treatment, an active peptic ulcer may be present, or the ulcer may recur. The CYP2C19 gene mutation of the P450 enzyme, which is involved in PPI metabolism, may influence the acid-inhibitory effects. Compared with adults, our patients had a more favorable prognosis. In this study, only eight patients experienced GPU recurrence, and one patient underwent surgery. This suggests that the GPU patients in this study did not have severe illnesses, such as cardiovascular, pulmonary, renal, and metabolic diseases, and this lack of illness resulted in better outcomes., Furthermore, the GGUs healed with no recurrence; one of the main reasons for this finding may be the low number of GGU patients. For adults, recurrence of PUD is more common in the elderly, males, and those with comorbid chronic kidney disease and this finding differed from those in our pediatric patients. The recurrence of GDU may be associated with H. pylori eradication failure. In conclusion, this study showed that children with GPUs more commonly had GDUs. Children older than 6 years have a high risk of GPU. H. pylori infection was the most important risk factor for GPU. Effective medical interventions could cure or improve these patients' clinical symptoms. Venerito M, Malfertheiner P. Interaction of Helicobacter pylori infection and nonsteroidal anti-inflammatory drugs in gastric and duodenal ulcers. Helicobacter 2010;15:239-50. Hernandez C, Serrano C, Einisman H, Villagran A, Pena A, Duarte I, et al. Peptic ulcer disease in Helicobacter pylori-infected children: Clinical findings and mucosal immune response. J Pediatr Gastroenterol Nutr 2014;59:773-8. Cloud ML, Enas N, Humphries TJ, Bassion S. Rabeprazole in treatment of acid peptic diseases: Results of three placebo-controlled dose-response clinical trials in duodenal ulcer, gastric ulcer, and gastroesophageal reflux disease (GERD). The Rabeprazole Study Group. Dig Dis Sci 1998;43:993-1000. Yang RQ, Mao H, Huang LY, Su PZ, Lu M. Effects of hydrotalcite combined with esomeprazole on gastric ulcer healing quality: A clinical observation study. World J Gastroenterol 2017;23:1268-77. Milosavljevic T, Kostic-Milosavljevic M, Jovanovic I, Krstic M. Complications of peptic ulcer disease. Dig Dis 2011;29:491-3. Pecha RE, Prindiville T, Pecha BS, Camp R, Carroll M, Trudeau W. Association of cocaine and methamphetamine use with giant gastroduodenal ulcers. Am J Gastroenterol 1996;91:2523-7. Nussbaum MS, Schusterman MA. Management of giant duodenal ulcer. Am J Surg 1985;149:357-61. Koletzko S, Jones NL, Goodman KJ, Gold B, Rowland M, Cadranel S, et al. Evidence-based guidelines from ESPGHAN and NASPGHAN for Helicobacter pylori infection in children. J Pediatr Gastroenterol Nutr 2011;53:230-43. Iwanczak BM, Buchner AM, Iwanczak F. Clinical differences of Helicobacter pylori infection in children. Adv Clin Exp Med 2017;26:1131-6. Newton EB, Versland MR, Sepe TE. Giant duodenal ulcers. World J Gastroenterol 2008;14:4995-9. Peetsalu A, Kirsimagi U, Peetsalu M. Methods of emergency surgery in high-risk stigmata peptic ulcer hemorrhage. Minerva Chir 2014;69:177-84. Huh CW, Kim BW. Clinical significance of risk factors for asymptomatic peptic ulcer disease. Clin Endosc 2017;50:514-5. Ecevit CO, Ozgenc F, Yuksekkaya HA, Unal F, Arikan C, Yagci RV. Peptic ulcer disease in children: An uncommon disorder with subtle symptomatology. Turk J Gastroenterol 2012;23:666-9. Fleischer AB Jr, Gardner EF, Feldman SR. Are patients' chief complaints generally specific to one organ system? Am J Manag Care 2001;7:299-305. Allen BC, Tirman P, Tobben JP, Evans JA, Leyendecker JR. Gastroduodenal ulcers on CT: Forgotten, but not gone. Abdom Imaging 2015;40:19-25. Alimadadi M, Seyyedmajidi M, Amirkhanlou S, Hafezi AA, Homapour S, Vafaeimanesh J, et al. Impact of creatinine clearance on Helicobacter pylori eradication rate in patients with peptic ulcer disease. Iran J Kidney Dis 2015;9:427-32. Cheon JH, Kim JH, Lee SK, Kim TI, Kim WH, Lee YC. Helicobacter pylori eradication therapy may facilitate gastric ulcer healing after endoscopic mucosal resection: A prospective randomized study. Helicobacter 2008;13:564-71. Okamura Y, Takeno S, Takahashi Y, Moroga T, Yamashita S, Kawahara K. Refractory ulcer of reconstructed gastric tube after esophagectomy: A case report. Ann Thorac Cardiovasc Surg 2013;19:136-9. Hua MC, Kong MS, Lai MW, Luo CC. 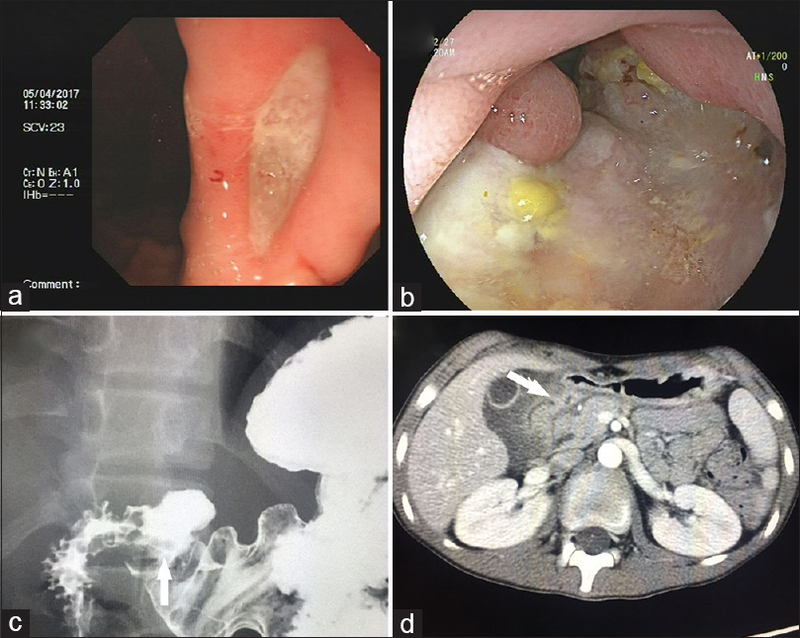 Perforated peptic ulcer in children: A 20-year experience. J Pediatr Gastroenterol Nutr 2007;45:71-4. Reusens H, Dassonville M, Steyaert H. Laparoscopic repair for perforated peptic ulcer in children. Eur J Pediatr Surg 2017;27:251-4. Seo JH, Hong SJ, Kim JH, Kim BW, Jee SR, Chung WC, et al. 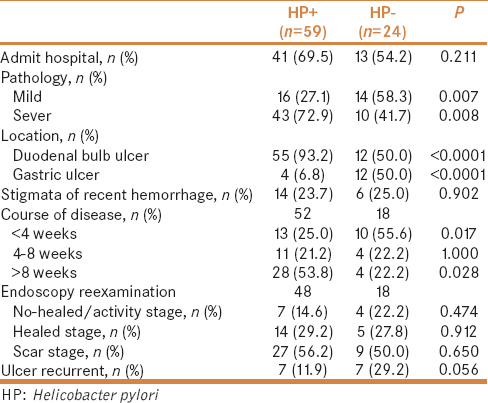 Long-term recurrence rates of peptic ulcers without Helicobacter pylori. Gut Liver 2016;10:719-25.